Have you been doing any fun fall-inspired activities? I’ve got a whole list of our favorite fun fall activities if you’re in the Tampa Bay area! We have done a few of them already this year but I’m most looking forward to going to the Epcot Food and Wine Festival in Walt Disney World. It’s our favorite event all year! We’re going to attend a few of the special foodie events that they have so I can share them with you on the blog when we get back home. Does Liking Pumpkin Make You Basic? When girls (or women…shocking I know) refer to themselves as “basic” for liking pumpkin flavored things. I’m sure by now you’ve seen the #Basic on Instagram pictures of girls drinking pumpkin spice lattes, right? Where did that even come from? Who made that term up? It’s simply not true and I feel it’s demeaning. How could liking a seasonal flavor make you “basic?” I feel like it would make more sense if they said that about people who like vanilla. BTW I love vanilla and pumpkin flavors and I’m definitely not basic in any way, shape, or form. So, ugh, that’s a big fat NO from me! 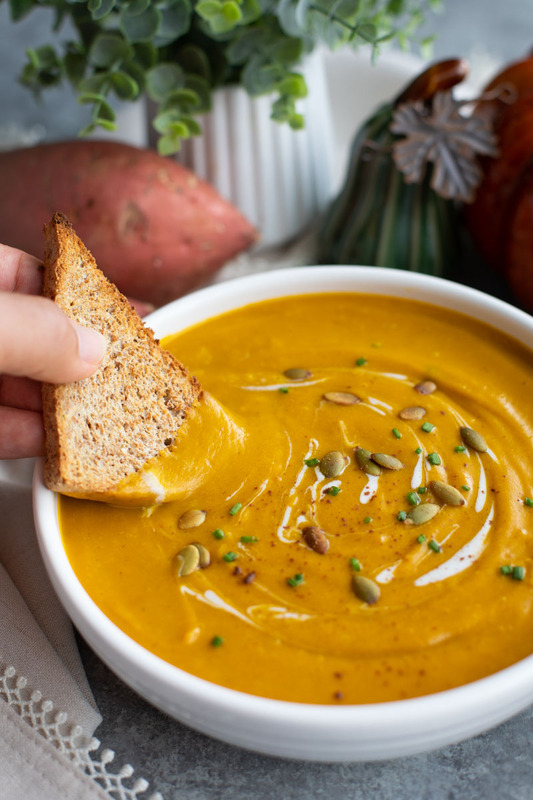 This ginger pumpkin carrot soup is so creamy with the perfect amount of sweetness from the carrots and just a touch of fresh ginger for a spicy kick. I love it with a crusty baguette for dipping, dunking, and wiping the bowl clean! It would be really delicious to eat out of bread bowls too or with a grilled cheese sandwich. I like to serve the ginger pumpkin carrot soup with toasted (or raw) pumpkin seeds for a garnish. There’s something about making soup during the fall, it just makes your home feel so cozy and comforting. Fill your belly with warm soup and toasty bread, then snuggle under a fluffy blanket to relax and watch a Halloween movie like Hocus Pocus. Now, that sounds like a great night to me! If you’re making the ginger pumpkin carrot soup for Halloween, I would fill a squeeze bottle with sour cream or greek yogurt and make a spooky spiderweb design on the top of the soup. You could even add a plastic spider hanging off the side of the bowl for effect. I served this ginger pumpkin carrot soup at my flavors of fall party that I threw last year. I served the soup in little punch cups so my guests could just pick them up and drink the soup right out of the cup. It was a big hit! Saute onions and carrots in olive oil over medium heat in a large pan for 10 minutes, or until carrots begin to soften. Add the garlic, ginger, cayenne pepper, pumpkin pie spice, salt, and pepper. Mix to combine and cook for 1 minute. Add the pumpkin puree, vegetable broth, and water. Bring to a boil, reduce to a low simmer, cover and cook for 45 minutes. Use an immersion blender to blend until smooth and creamy. Stir in coconut milk, let it cook for 5 more minutes to blend all the flavors. Sprinkle toasted pumpkin seeds on top right before you serve. 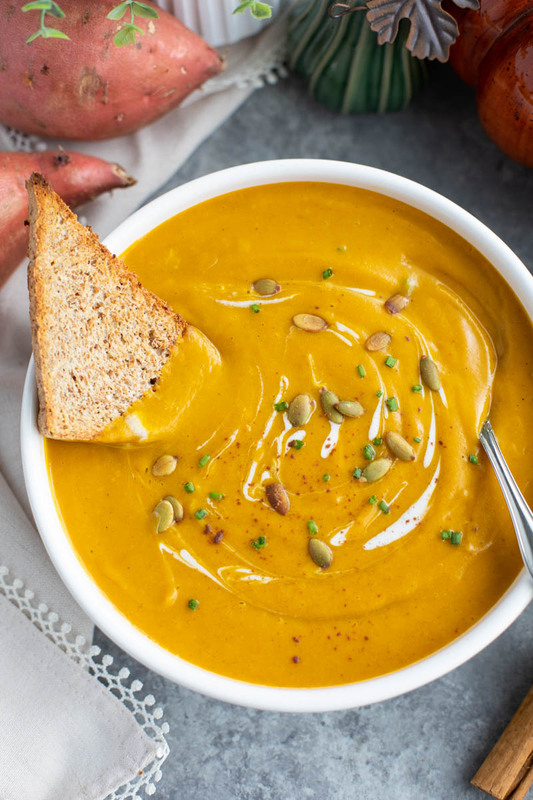 I just know you’re going to love this ginger pumpkin carrot soup! If you make it, please post a picture of it with the hashtag #StaceyHomemaker so I can see your beautiful creation! What’s your favorite pumpkin recipe? Let me know in the comments! ***The above links are affiliate links. Any Amazon purchases made through these links help support StaceyHomemaker.com at no additional cost to you.